Do you have chemistry with your drinks? If you have a friend who is a scientist, or even if you just know someone who was a chemistry major in college, these interesting shot glasses will undoubtedly put smiles on their faces. 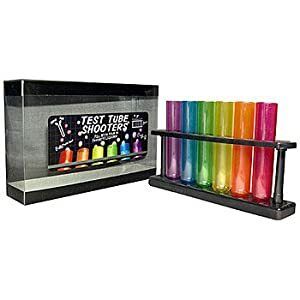 The Test Tube Shooters Shot Glass Kit gives you six multi-colored plastic glasses in the shape of test tubes, complete with a display rack, so these shooters will look pretty even when not in use. 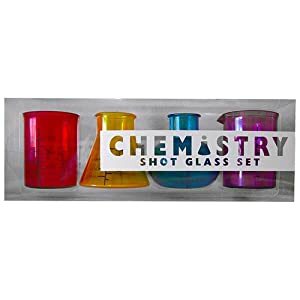 Alternatively, the Chemistry Shot Glass Set gives you four differently-shaped glasses that look like the beakers and other vessels used by laboratory scientists. Heck, these are so cool that they’ll amaze any of your friends – whether they’re geeks or not! This entry was posted on Wednesday, May 16th, 2012 at 9:00 pm by Cordial-Glasses.com	and is filed under blog. You can follow any responses to this entry through the RSS 2.0 feed. Responses are currently closed, but you can trackback from your own site.